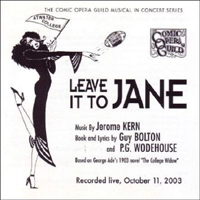 Concert Cast (Comic Opera Guild, 2003; available through comicoperaguild.org) (2 / 5) The Ann Arbor, Michigan-based Comic Opera Guild delights in resurrecting early musical comedy and operetta scores that no one else would think of recording. (The Ameer, anyone?) 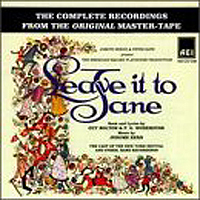 Their Leave It to Jane is typically dutiful and a little dull; Jane (Diane McEwen-Martin) has a pretty soprano but almost no characterization, nor does leading man Glenn Perry make much of an impression. Among the supporting players, only the Stub Talmadge of David Troiano exhibits some personality, and Katie Cillufo’s Flora misses all the jokes in “Cleopatterer.” Some of the choral lyrics are hard to discern (this is a live recording), and one number from Kern’s Oh, Boy! is bizarrely ushered in to buttress the finale. But hey, it’s a charming score, and the two-piano arrangements are occasionally quite tasty. — M.M.